Please join us for the first installment of our Association Education Series! 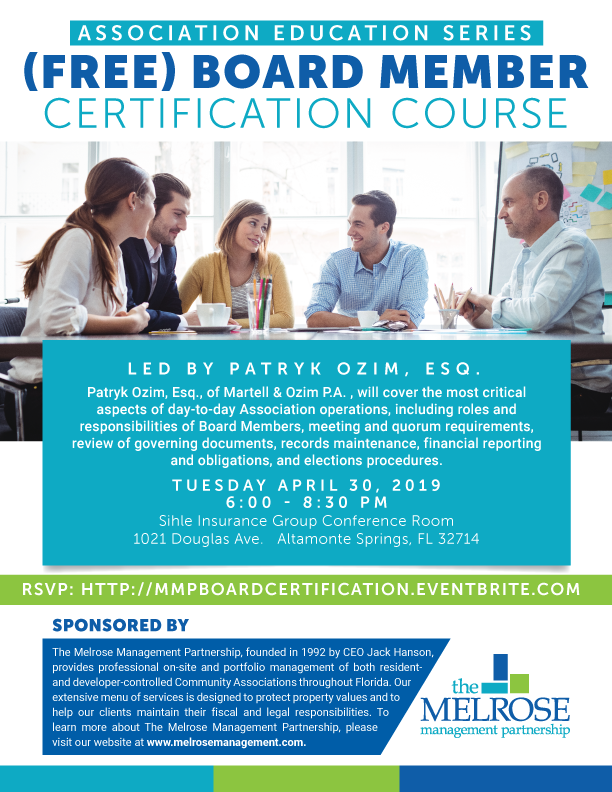 Community Association Law Attorney Patryk Ozim will lead the course and deliver information that Board members need to best serve their communities. We invite you to explore the course description below. LED BY PATRYK OZIM, ESQ. Patryk Ozim, Esq., of Martell & Ozim, P.A., will cover the most critical aspects of day-to-day Association operations, including roles and responsibilities of Board Members, meeting and quorum requirements, review of governing documents, records maintenance, financial reporting and obligations, and elections procedures.